Millenials, also more commonly know as Generation Y are the demographic cohort following the Generation X. There are no precise time spans in terms of birth years for this generation. The range by regarded as most true for them however has been seen to be from 1980 to early 2000’s. This infographic by Badgeville Blog, the #1 gamification platform, tracks the rise of this Millenial Generation. It speaks out to marketers and managers alike about their demographic composition and behavioural characteristics. Also termed the Net Generation, there are currently estimated to be 76,370,030 millenials living in America today. It is essential for managers and marketers to realize how rapidly different this generation is from previous generation as consumers, employees and social beings. Things like business impact, job loyalty and brand loyalty have a different, lesser meaning in todays society. Relationships and the way we perceive them have changed significantly too. The average persons attention span today is way lesser than it used to be , and all these things matter a great deal for business’s. All in all, a superb infographic that is tremendously informative. 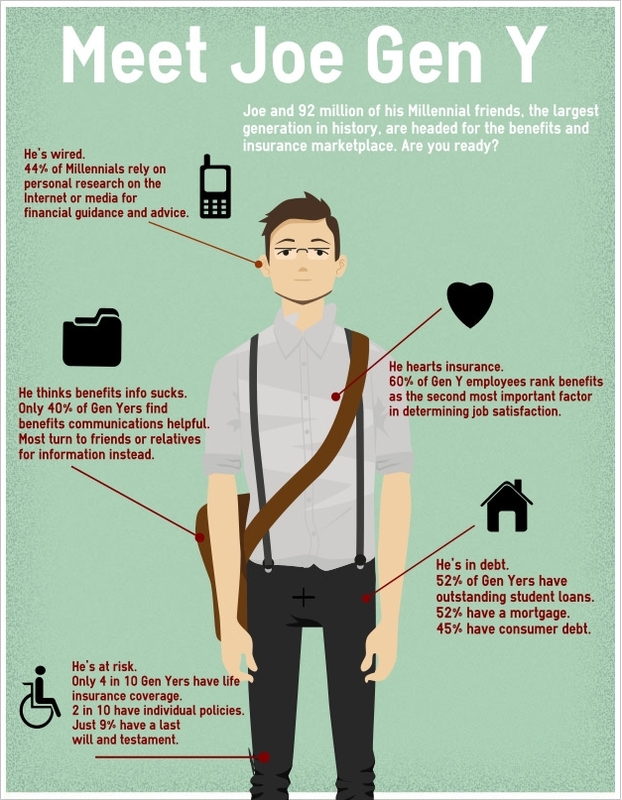 To help us understand this group, or generation better, lets meet Joe Generation Y. This graphic by Life Health Pro tells us that 92 million Millenials by virtue of their lifestyle are heading for the benefits and insurance industry. It seems a major or larger percentage of Millenials now have life insurance, are overqualified but unemployed and hence burdened with debt, or have heart insurance. Benefits are the second most important aspect of job satisfaction. 44% of Millenials research on the internet or media for financial advice.